Pretty much the same as the Brett #1, but with B. Lamicus instead of Bruxellencis. Also dropped grain bill a tad. That's a much whiter krausen than saccharomyces... unless it's a light thing. Yeah, it's definitely whiter than most saccharomyces krauzen. Looks like a rocky white head on a beer. Steven, I'm sure you already have a good idea about this but the pitching rates for this bacteria is very different than regular yeast (what is regular yeast really?). So the behavior of the yeast and the amount that is required varies quite a bit depending on what you want to accomplish. 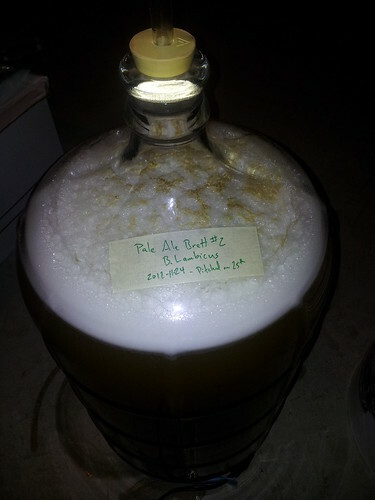 For example, some folks use Brett after primary fermentation is complete and add for bottle conditioning/aging etc. Pliny - Yep, I have a pretty good idea of pitching rates for the Brett strains I am working with (FYI they are not bacteria, but yeast, similar to Saccharomyces). I will be using bacteria soon though (Lactobacillus). Pitching rates are similar to Sacch. The table (link below) illustrates the effect of different pitch rates for 3 strains of Brett on various compound produced as a result of different pitch rates. Effects were evident but were minimal. Steven, did you ever compare brett-b from wyeast vs brett-b from Orval? did you ever compare brett-b from wyeast vs brett-b from Orval? Good question. No I haven't (yet). I have only used Brett B from Orval in secondary and Brett B from Wyeast in Primary. I will be washing the Wyeast Brett B this weekend and I plan to try it in a secondary soon. I should have my 20 gallon system in in a couple of weeks, then I will be able to try them side by side with the same wort.